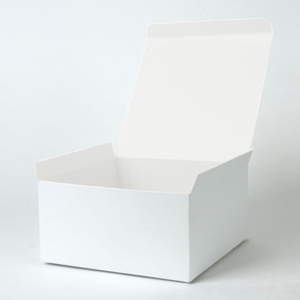 Provide an upscale presentation of your gift or product with the new and improved white one piece flip-up box from Firefly Store Solutions. The one piece construction of each box makes it easy to store and assemble. This premium gift box features a white exterior and a white interior and is the perfect solution to quick and easy gift packaging. We also offer a wonderful selection of gift wrap to complete the presentation of your brand. • 8" x 8" x 4"